Who doesn’t love a good cookie ? Over the years we’ve sampled ALOT of dog cookies in our dog family and though some are tried and true with high quality ingredients, they often cost a fortune and don’t last too long with multiple dogs. We decided that with all the human emphasis on healthy eating there has got to be someone making healthy cookies that would like to share their secrets and wow are there resources out there! Here is a simple recipe with very little prep time, that we thought you might enjoy. Hope they make your dog’s ears wiggle !!! 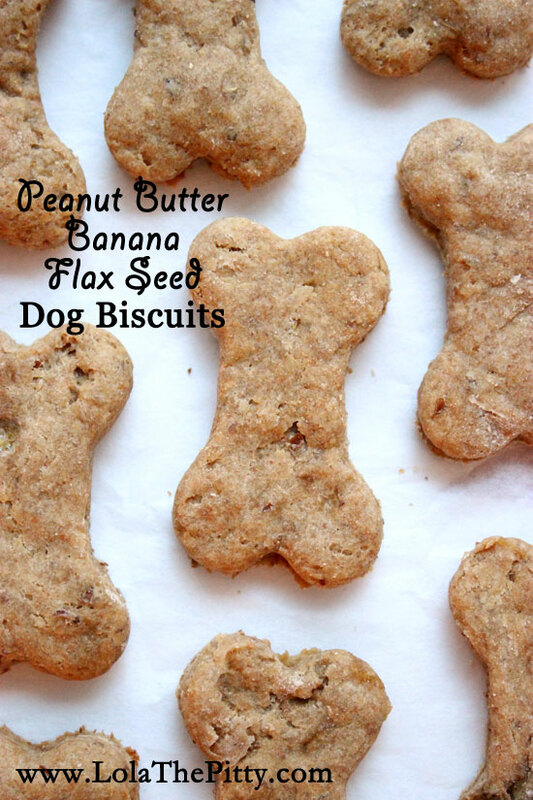 Simple, small batch Peanut Butter Banana + Flax Seed Dog Biscuits! This recipe is a breeze to pull together and is a nutritious snack for your dog! Mix ingredients together thoroughly using a spatula until well combined. Roll out mixture on a floured surface to approximately ¼”. Cut into desired shapes. Repeat with remaining dough. Place on a nonstick baking sheet and bake for 20 minutes. *This yielded 24, 2-inch dog treats for me. *Store in a airtight container. We hope you enjoyed Sarah’s recipe and that you and your dog’s enjoy many good dog moments !!! Has Your Dog Forgotten Everything You’ve Taught Him ? So why is it that your dog seems to forget things he use to know so well ? Just like people, dogs tend to do what works. Permanent change happens when the new behavior becomes the default. This means that if you have a dog that is a jumping fool and mugs every person that comes to the door he needs to learn how to sit and stay under these same circumstances. The behavior of sitting and staying need to be repeated to the point where he’s been rewarded for it so much that he chooses to sit instead of jump because it has been rewarded so many times it has become his new default and replaces jumping. Though most dogs pick up how to sit and stay easily, most trainers don’t prepare them for all the circumstances they will be required to perform the behavior under. The more variables you add to sit/stay while the dog is in the learning phase and the more you teach him how to perform the behavior in real life, the better able he will be to sit and stay when company comes to visit. Dogs will only default to the new behavior if they know it well enough, otherwise the old behavior will creep back in when there is less vigilance or during periods of less practice like the winter time. The solution is to go back and rehearse the right behavior until it takes over again. Maintenance of the new behavior is required until it becomes the default which takes a lot of time and vigilance. This means that every person your dog meets needs to be treated as a training session for a while so that you dog learns exactly what pays when he is around visitors. If he thinks he has options (jumping, mouthing, pulling on clothing) he will try different things to get attention. If we want a dog that can greet people politely we need to teach him that sitting and staying is the only thing he can do to get paid (get attention, a cookie, or the opportunity to play with the visitor). Maintaining good behavior is a lot like exercising for people. You can’t lift weights once a week and hope to get in shape. Exercise needs to become a regular habit that must be practiced regularly or no results will be seen. It’s easy to default to bad habits and behaviors that are easy when new behaviors are hard and so regression is far more common then any of us like to admit. The good news is that we can combat this with tons of rehearsal and practice until the newly learned behavior starts to trump all the old behaviors. Vigilance comes into play as the new behavior starts to take over so that when the dog has the opportunity to make a choice (jump on the person or sit instead) and the right behaviors can be rewarded and the wrong ones are either prevented or ignored. This is how we permanently make the change to the trained behavior and once we have reinforced the correct choice enough the dog will now default to the new more polite way of greeting visitors. Who among us hasn’t experienced the frustration of teaching our dogs a behavior that we feel he “knows” and then taking him somewhere only to find out that it falls apart completely in a new environment. For instance the dog that will hold a sit/stay at home with ease but is a jumping maniac when you take him on a walk or the neighbors come for dinner. The key to a well behaved dog that can listen and respond to the behaviors you have taught him in any environment is your ability to assess his threshold of tolerance for distractions. A training threshold is the place where the dog is beginning to notice the distractions in the environment making it harder for him to perform a behavior he may perform perfectly in a quiet environment. In training all dogs it is important to be aware of what your dog’s thresholds are for any behavior but especially those that are newly acquired. Dogs that are in the learning phase of their training have acquired some of the basics of the behavior but don’t always perform it reliably under all circumstances. In order to successfully train a dog to respond in any environment you need to not only be aware of what your dog’s thresholds are but know how to manipulate the threshold so as to help the dog learn to perform the behavior in the new environment. An example might be a dog that is just learning how to “leave it”. The set up at home might be that you can drop a cookie on the floor in front of your dog, say “leave it” and your dog will not lunge for the food and look at up at you quickly to earn his reward. This is an example of a SUB-threshold environment. Under these circumstances the dog has learned the behavior and is reliable in doing it when you ask. On a walk around the neighborhood however when you do this same set up he is much slower to back off and look at you, many times only doing the back off and never looking up. This is an example of being ON the threshold. Being on the threshold means that he is still able to perform part of the behavior, but the complete behavior is either missing or has a very slow response. When this happens it is important to have some tools for helping your dog be successful. 2. Use a better treat. Switch to something he LOVES! 3. Ask for a previous step for a bit before moving forward. In the case of ” leave it” you would go back to the back off step for a bit before waiting for the looking back at you step. 4. Quit and re-group. If you find that your dog is not making forward progress end the session and try again later. Sometimes it takes repeated exposures to make the progress you are hoping for. If you can’t get the dog to perform a lesser step of the behavior or he stops eating or he doesn’t respond to your cues at all you know you have gone OVER threshold and should stop the session. Trying to train a dog who is over threshold is fruitless, he is too aroused and excited to learn anything and needs you to help him calm down and go somewhere quieter. Sitting down and figuring out a new place to work that isn’t quite so exciting is a logical next step and will insure that you are building his tolerance and his skill set step by step. Training programs that are built on slow progressions and thoughtful management of distractions end with dogs that are completely and reliably trained to respond to all of your cues in any environment.